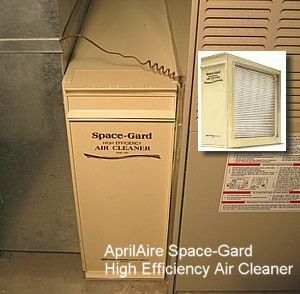 The Space-Gard whole-house air purifier is a high-efficiency furnace air filter that removes dust, dust mites, mold spores, pet dander, pollen, bacteria, viruses, smoke, and other contaminants from the air circulating through the furnace system. The filter is designed to become more efficient with use. It typically should be replaced once a year. This diagram shows the components of the filter assembly and how they fit together. The filter media is pleated like an accordion and is stretched across the plastic housing and fastened at the top and bottom. Multiple plastic pleat spacers maintain consistent spacing between the pleats. Turn off the power to the furnace. Remove the filter access door by lifting it up and off of the metal furnace frame that contains the filter. Slide the plastic filter housing out of the frame. With the black plastic pleat spacers facing up, unsnap and release the plastic latches on the tops of both side panels. Remove the black pleat spacers from the top and bottom housing rails. Open the plastic flaps on the top and bottom of the filter housing. Slide the cardboard ends of the old filter off the plastic hooks onto which they were fastened. Remove and compress the old accordion-like filter media and dispose of it properly. Clean all dust and debris from inside the filter frame, using a vacuum. Remove the new filter from the box and inspect it carefully to make sure it is not ripped. Place the filter into the plastic filter housing so that the side with the alignment yarn is facing upward. Spread out the filter so it fills most of the housing. Place one end of the filter's cardboard flap on the bottom of the housing, hooking it onto the plastic hooks. Expand the filter to the other side, and hook the other cardboard end onto the hooks. Snap the plastic flap closed on both ends, top, and bottom. Install the pleat spacers one at a time. To place the first spacer, start at one end of the filter and carefully insert one tooth of the spacer into each pleat. Make sure you do not have any pleats doubled up. Insert the remaining spacers close together, and near the first spacer; this makes it easy to insert the spacer combs into the open pleats. When all of the spacers are in place, slide each spacer down to its corresponding notches in the top and bottom holding brackets of the housing, then snap the spacer into place in the notches. Secure the filter media by snapping the closure flaps closed at the tops and bottoms of the side panels. Slide the filter housing back into the filter frame, and reinstall the filter access door. Turn on the power to the furnace to complete the job.